Burgos (Spaingie pronunciation: [ˈburɣos], UK /ˈbʊərɡɒs/, US /ˈbʊərɡoʊs/) is a ceety in northren Spain, historic caipital o Castile. It is situatit on the confluence o the Arlanzón river tributaries, at the edge o the Iberie central plateau. It haes about 180,000 inhabitants in the actual ceety an anither 20,000 in the surroondins. 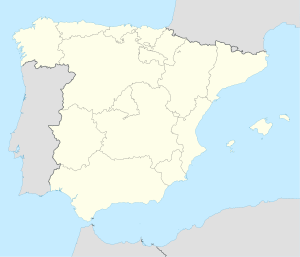 It is the caipital o the province o Burgos, in the autonomous commonty o Castile an León. The Burgos Laws or Leyes de Burgos which first govrened the behaviour o Spaniards towards the natives o the Americas wur promulgatit here in 1512. This page wis last eeditit on 10 Mairch 2018, at 23:45.